"According to a 1991 Library of Congress report, it is considered the second most influential book after the Bible in the lives of its readers. A complex combination of mystery, love story, social criticism, and philosophical concepts, the 1,100 page novel embodies the author's passionate celebration of individualism, free will, capitalism, logic, and reason. ... The apathy of the people is summed up in a new slang expression, 'Who is John Galt?' which conveys hopelessness, fear, and a sense of futility, as well as everything unachievable and imagined." VII ~ "This is John Galt Speaking"
Does anybuddy want to read Atlas Shrugged with me? Come read this post at Book Buddies (click the blue link in your email). Count me in! I was delighted to read the invitation e-mail that another book was to be discussed with Book Buddies. The library had the book yesterday so I checked it out and am ready to begin reading. I am trying to finish my youngest son's quilt for his August wedding and then plan to start a quilt for my daughter's wedding next week (my son was engaged first so his was started first)so I wondered whether I should start the book, but when the library had the book I thought that was the gentle push I needed to join in. I hope some of the others join in as well. I would love to read this with you all. when do you plan to start? Things are kinda busy at work right now so I hope by the weekend I will have a copy. Shirley and Marylyn, you should start reading as soon as possible, since I'll start reading the first chapter tonight. We four in-town friends had lunch today. Ginnie, who suggested we do this, had already read the book and wanted to talk about it. Donna and I got our books a few days ago, and Emily got hers today. I will post my thoughts here at Book Buddies as I go along, rather than having a certain number of pages each week. Let's keep each other informed, HERE, about our progress. I hope to get through the book in about a month, but we'll take as long as necessary to discuss it. I was pleased to learn that Marilyn is joining us. I read most of the first chapter yesterday, but will try to pick up the pace. I doubt that I finish reading it in a month. The transcontinental railway has several connections in my family as my husband retired after over 30 years as a brakeman on the Union Pacific Railroad. My brother worked for Santa Fe (now BSNF) and my oldest son was passionate in his love of trains especially steam engines. Shirley, I had to look up the meaning of those initials, which (according to Google) should be BNSF, for Burlington Northern Santa Fe railway company. Other than having taken a train trip to Florida with my Aunt Bonnie when I was seven (in 1947), I know little about trains and railways. Whoops! Sorry about turning the letters around. After Santa Fe became BNSF, the department my brother works for was eliminated and they became contract employees working for IBM doing the same thing. Because of the retirement age difference between IBM and railroad retirement, this had a negative impact on my brother's retirement as well as made the job less secure. I haven't ridden much on trains. However, when Amtrak was taking over the passenger trains (around 1970) my husband and I took a trip to Las Vegas while it was still a Union Pacific train. My sister, kids, and I took an Amtrak train from Washington, D.C. to New York several years ago. My other passenger experiences have been rides associated with Railroad Days that used to be held each year in Topeka and also train rides oriented to tourists in various cities I have visited. I got the book on my kindle and trying to catch up. My Uncle Marty worked for the railroad there in Chattanooga up until he passed. Im with you Shirley, dont think I'll finish in a month work is suoer busy, but Ill give it my all. Since the book is 1200 pages, the Kindle would make it much more portable. How do you like the Kindle, Marilyn? I'd considered buying one with birthday money last year, but realized that I am reading less than I used to and I like the fact that most of the books I read are free from the library so opted to stick with the old fashioned mode of reading. I've read the first six chapters. In chapter 6, more is explained about John Galt. Dagny is certainly a modern woman. Well, ladies, I'm in the middle of chapter 4, and I'm struggling to read the fine print of the mass market paperback. Such small letters! Donna and I agree there's no way we'll finish in a month. Emily, the other face-to-face friend in our group of four who is just now reading the book says she can't finish in a month, either, but we'll discuss whatever we've read by the day we've agreed to meet again. In normal print my kindle shows 20,000 plus pages. I made the print readable and it more than doubled the number. I have to keep telling myself "its not real" to keep from giving up. Marylyn, my small-print edition is 1069 pages, counting the introduction. How in the world did your Kindle come up with 20,000 pages? @Shirly, I love the kindle and a big part for this reason. Unlike the other readers, Kindle will let you down load from any source and any type of file. So If you have or can find a PDF verson (like from google books or a turrent) you can down load it for free. @ Bonnie, The reason for so many pages has to do with the way its downloaded into pdf form, too hi-tech for me. Thanks for the additional info on the Kindle. Something I'll have to reconsider. I had hoped to read a chapter a day to meet the month goal Bonnie and her group had, but it isn't working out for me so it is just as well that that face to face book has realized that the month goal may not be realistic for them either. I noticed the small font version at WalMart with its reasonable price so that I could keep it in mind if the library doesn't let me renew the copy I've checked out and I also was concerned about being able to read it. I am now on chapter 7 and suspect that the relationship between Dagny and Rearden may be becoming more than just the business interests. I usually don't like extramarital affairs (such as Arnold's), but Lillian's coldness and inability to appreciate the things that Rearden is accomplishing certainly makes one understand the desire to gain appreciation from someone like Dagny. I don't understand Francisco's tactics with the mine, but I have many more pages in which to gain better understanding of him. I’ve only just hit the 20% mark! And I’m riding the John Galt at 100mph through the countryside. My favorite thing so far in the whole book is the centuries of the guard lining the rail. Shirley, I am with you on extramarital affairs, and I really hate Lillian's behavior towards her husband. Much like Rearden I am very interested to find out why she married him, she sure doesnt seem to like him. My progress is slowing down. Probably not a correlation with the negative impact of the controlled slowing economy in the book. The political slant appearing to support uncontrolled free enterprise is a bit much at times, but I am enjoying the character development particularly the relationships between Dagny and Rearden with added information about Lillian and between Jim and Cherryl. Since I realized that I wouldn't be able to finish the book (I've finished the first part and started the second) before it was due back at the library even if I was allowed the two additional checkouts if no one else requested the book, I was pleased to buy a copy at a used book store. That takes the pressure off of reading so I don't have to worry when the John Galt isn't going at 100 mph! It was good to see your post, Marilyn, as I was wondering how the other buddies were coming along. THIS other buddy is at a standstill, but I do hope to get back into the book. Maybe tomorrow. I'll try. I'm not enjoying the book at all. I am glad that you are doing all right as I had wondered about your lack of comments. Are your face to face buddies enjoying the book? The smaller font that you are reading in the mass paperback wouldn't help matters. It is quite long--I think it could have said the same thing in many less pages. I find it somewhat interesting, but not interesting enough to want to read more than a few pages at a time. I wish that the chapters were shorter as I always like to be able to finish a chapter in a setting. Hopefully, as we get more in the flow of the book we'll each find it more enjoyable of a read. It doesn't help that I disagree with the pro-free enterprise non-regulatory stance. The regulatory bodies in the book are quite extreme, but the point taken is still the same. Three days in a row now I have looked at the new Lisa See book and had to make myself not buy it because I know "Atlas" would get "Shrugged", pun totally intended! And I have Clara and Mr. Tiffany by Susan Vreeland (2011) waiting at my bedside. Uh, it's right beside Atlas Shrugged, but which do you think I'll pick up when I finish Not My Daughter? Whew! That's a lot of reading, Bonnie! When listening to my podcast today of Planet Money, it was a discussion of Tim Harford's book Adapt which indicates that companies have to be able to fail in order for new companies and innovations to provide growth. In our current company in which the major financial institutions have become too big to fail, it creates problems. The podcast also referred to the inability of economies to grow when failure is not allowed such as in planned economies like the former Soviet union. I thought this tied in quite well with Atlas Shrugged. Maybe if more in my world would link to the book, it would boost my reading speed. On the positive side, the book has not drawn me in to the point of taking away quilting time. I am making progress on the wedding quilts and am now working on the binding for the quilt for my son. Is anyone still reading Atlas Shrugged? I set it aside as I had a library book that I needed to read (The Pioneer Woman--Black Heels to Tractor Wheels) which sure reads a lot faster than Rand's book. I plan to get back to Atlas Shrugged though. So I jumped in to War Trash (the most current release they have at the onbase library) but I really like all Ha Jin’s work. I am ready to pick Atlas back up just before my Duty night and the long weekend so I hope to make some good progress. That will be great to get some discussion going. Atlas Shrugged is not only long, but a slow read. There were some spots that seemed like propaganda on the evils of governmental controls, but once a person gets to know the characters better it becomes a more enjoyable read. Travel channel has a show called off limits, I just happen to catch the episode on east Tennessee. They did a clip about a mine community and it really puts you in the mind of atlas. The town failed because the train moved its route. But the company had built the town, ofcourse they "owed it all to the company store". There was also a really cool clip about how Chattanooga beat the floods by raising the street level and you cant talk about Tn with out bringing up the TVA. Railroad and highway routes sure were the making and breaking of many towns. Atlas Shrugged does a good job of showing the interplay between the impact of business success/failures not only on each other, but on the public at large. Glad to hear that Chattanooga outsmarted the floods by building higher. Whenever I hear the Chattanooga Choo Choo (usually at outdoor band concerts), I think of Bonnie. I am slowly making progress on the book, but miss hearing from other readers. Bonnie, are you doing all right? Marylyn, were you able to do any reading over the extended weekend? One of the first notes I made from the book was Dagny's question to Francisco in chapter 5: "Francisco, what is the most depraved type of human being?" and he replied, "The man without a purpose." A Bible study I went through a few years ago was based on Rick Warren's book "A Purpose Driven Life" (it started off helpful, but fizzled out midway through. I still live my life day by day with some goals, but haven't clearly defined a purpose. Perhaps I have a purpose albeit undefined so I won't have to categorize myself as a depraved type of human being. One "purpose" right now is to try to finish this book by the end of the year. Maybe that's a goal though instead of a purpose. I have been on and extended break from "Atlas". Shirley, a lot has been going on in my life, including someone entering my home while I was asleep and taking my laptop, making it harder for me to be online. I discovered the loss on Sunday morning, June 12th. I'm glad I didn't hear the burglar(s) because I might be dead or badly hurt. As I mentioned before, I bought the mass market version of this book in May, but its teensy print gave me a headache and I quit reading at 76 pages. Finally, I have the library copy that I've waited two months to get. However, this 1168-page hardback weighs four pounds (yes, I put it on a scale), and now it's my arms and hands protesting rather than my eyes. I'm not sure I even want to finish reading Atlas Shrugged. I have completed the 336 pages of Part I. My friend Donna has already announced to the in-town group that she's given up and will NOT be reading any more of it. I am very sorry to hear of both the break-in (horrible feeling in itself) and the loss of your laptop. I agree that the blatant political slant of the book is very distracting (this is a tendency for many Christian book writers as well; the message in them is usually good, just not very interesting reads). I guess I prefer more subtle attempts to brainwash me. I have considerably slowed down on the reading of Atlas Shrugged to the point that I read two pages each morning and then go to my preferred activities of sewing or quilting before getting ready for work. I think it is easier to take in small doses. I can fully understand the decision not to invest more time in the book. I haven't decided if that is what I'll do or not. Marilyn, what are your plans? I was reading a blog and noticed she and "Dan" (husband? friend? coworker?) had taken on the challenge of reading Atlas Shrugged together. How could I not check their blog about it? It appears they, too, bogged down (as I did) after reading the ten chapters of part one. That was over two years ago. 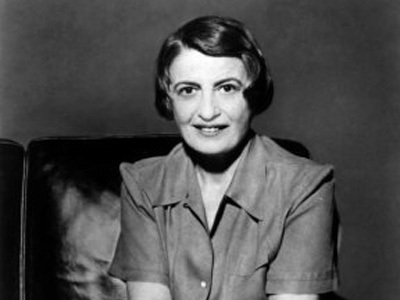 On their final post, Dan ends with this comment: "You are so not John Galt." Maybe their adventure ended in divorce? Remember me, createjoy, or "m". Just wanted to share that I too tried to read Atlas Shrugged on my own, and was not able to stay with the book, I just kept losing interest. I did whoever rent the 1st installment of the new movie, and will eventually rent the 2sd, and in time the 3rd when it is out. For myself I am please that this was an option.. LOL..
My question is did any of you ever finish the book? Hi friends, this is "m", used to be an active Book Buddie when you were all on "O". I have visited Bonnie group in a long long time, but today I was blessed with the inclination and time. 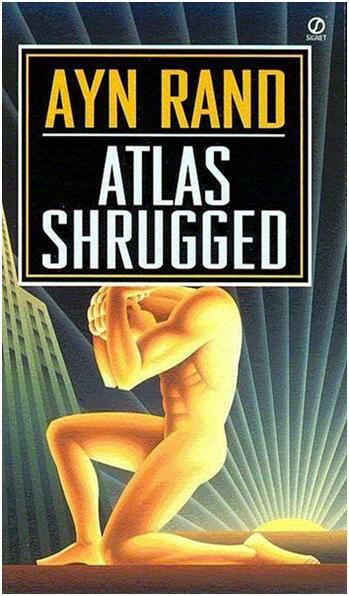 I wanted to share that I too tried to read Atlas Shrugged and could not complete the book. But during this past year I rented the Part 1 of the new movie out, and found it to be really good. Part 11 is now out, and I have heard they are developing a Part 111. Have any of you also viewed the film, what did you think? 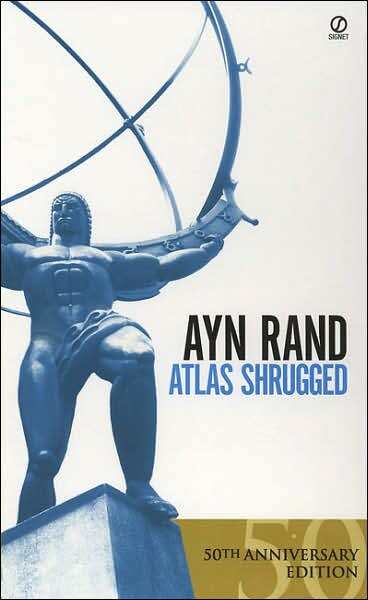 I meant to add that I'm done with Atlas Shrugged and don't plan to read any more of it or watch the movie. When I heard of Paul Ryan's adherance to Aun Rand's philosophy, I thought of our earlier attempt to read Atlas Shrugged. Watching the film version might be interesting, but I have no plans to finish the book or watch the movie. Interesting to read (actually, skim) through our comments about this book. I got on here to share an article I found online that may interest somebuddy (or not). Anyway, here's the link, with the "myths" from the book. And nope, I never returned to the book and don't plan to. Maybe the three myths (below) sum up the book, though I can't vouch for that. Thanks for the related article, Bonnie. It always pleases me when I hear or read something related to a book that we've shared earlier. I don't regret my decision to call it quits on reading Atlas Shrugged.